Born in Kiev, in the Ukrainian SSR of the Soviet Union (in present-day Ukraine) he is a cybernetics scientist; the Corresponding Member of the National Academy of Sciences of Ukraine, Dr. Sci. Tech., and Professor. 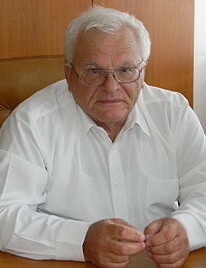 He is also a Doctor of the International Academy of Computer Science and the Academy of Technological Sciences of Russia; President of the Academy of Technological Sciences of Ukraine and an Honored Worker of Science and Technical of Ukraine. He is the follower of the known Ukrainian cybernetics Victor Glushkov. He deserves recognition for his work as the Chief Designer of the automated control system of the "Lviv" manufacturing project. Glushkov was the supervisor of studies on this project. Also intricately involved were Dr. Skurihin and Dr. Shkurba. In 1970 he and Glushkov and collective developers of the system "Lviv" were awarded the State Award of Ukrainian Socialist Republic. Since May 1, 1986, he has been involved in the liquidation of consequences resulting from the failure of the Chernobyl atomic power station. For his work, he has the gratitude of B. Shcherbina, Chapter of the Governmental Commission and the Vice-President of the Ministerial Council of the USSR. In gratitude they wrote of his active participation in works of liquidation concerning consequences of the Chernobyl failure. Beginning May 1, 1986, he worked directly in a failure-zone for the greater part of a year. In 1986, he also headed, "The Special Design Bureau of Mathematical Machines and Systems" of "The Institude Cybernetics Academy of Sciences", Ukrainian Soviet Socialist Republic. During this time, he organized the Special Design Office of Experts of the "Academy of Sciences of the Ukrainian Soviet Socialist Republic" and also organized the ministries and departments of the Ukrainian Soviet Socialist Republic concerning the situational forecasting of radiation pollution of the Dnipro River and the territory of Ukraine. Thanks to the work of this group, administrative decisions were made which prevented polluted waters from reaching the River Dnieper, from which half the population of Ukraine uses water. He was also honored with the Award of the Labour Red Banner for his work during the liquidation of the Chernobyl Atomic Power Station. He is the Chief Designer of the system, "RADA", a hardware/software complex for the support of decisions by public authorities at various levels. For this accomplishment, he and a group of developers were presented the State Award of Ukraine in 1998. This support system of decision-making for the legislative process of the Parliament of Ukraine ("Verkhovna Rada") and the councils of various levels known as RADA is intended for the information service of deputies by the preparation and carrying out of plenary sessions for automation of the process of voting and the recording of session operations. During the period between plenary sessions DDS RADA-3 gives connection with databases of other levels and is used for performance of works of various appointments, such as filling and support of current databases and formation of bases for preparation of bills. RADA-3 is a unique high-class congress system for the post-soviet territory. It has been introduced by various councils at different state levels in Ukraine and in several other countries too. More than twenty such systems are now in use. The "Situational Centre" is a modern creation of his. He has also founded and leads the scientific school known as "The Theory and Practice of the Creation of Intellectual Automated Systems of Support and the Acceptance of Collective Decisions".